This year's U.S. Chess Championship, held from May 7 to 17 at the Chess Club and Scholastic Center of Saint Louis should be more exciting than ever--for the first time since 2006, Hikaru Nakamura and Gata Kamsky are both playing. 24 contenders will compete for a $135,400 guaranteed prize pool. In addition to that, there is a $64,000 Fischer Sweep prize for anyone who can recall Bobby Fischer's 1964 performance and win every game. I'm also excited about this year's fantasy chess competition where YOU decide who will get more points in match-ups such as Shulman-Onischuk and Krush-Zatonskih. (You are predicting whether Zatonskih or Krush will get more points in the entire event, not what will happen if they are paired together.) 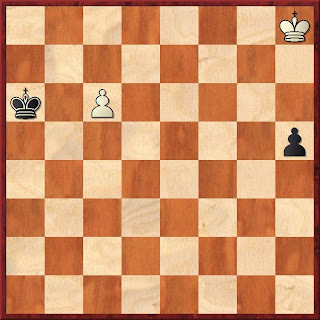 Here is a link to play: http://uschess.org/fc_2009/. Also see the detailed rules and prizes: http://uschess.org/content/view/9328/525. This event will be hosted on uschess.org, so to play, you need to register on the site or login (to register as a member, you need your pin number,which you can find on the back of any personal Chess Life label.) You must be an active USCF member to win the prizes which include a Monroi Personal Chess Manager, a signed chess board by all the participants and a copy of Kasparov vs.Karpov signed by Kasparov to a "Good Guesser". Once you enter, you can change your picks up to game time on May 8, 2 PM Central by returning to this link: http://uschess.org/fc_2009/step1.php. I'll be commenting live on the Championship daily along with GM Emil Sutovsky. If you're not in Saint Louis, follow the twitter feed and live streaming on the Internet Chess Club and uschesschamps.com. On uschess.org, read about club founder Rex Sinquefield and during the event, watch CLO for video wrap-ups, blogs and of course, fantasy updates by Arun Sharma. Good luck in fantasy chess and no matter how your team does, be sure to get the most out of what should be two very exciting weeks for chess fans! My April 2009 Scholastic Chess column at ChessCafe covered the 10-year-old Utah phenom Kayden Troff. TD Damian Nash reports that after Kayden's showing in the latest Utah Expert Series tournament in which Kayden beat two experts, his rating stands at 2013. One of these experts is a five-time Utah state champion and the other is currently the highest rated active player in Utah. In the April 2009 USCF Top Ten Age 10 list, Kayden was ranked #10 with a 1907 rating. But Nash states that Kayden is likely to jump to #1 in the next rating supplement (Nicholas Nip will apparently turn 11 by this next supplement). Congratulations to young Kayden Troff! 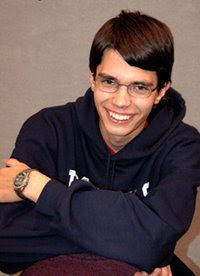 I was notified yesterday of the tragic passing of 19-year-old Landon Brownell, who had been an integral part of the powerful Catalina Foothills High School chess teams which won three national titles between 2005 and 2008. A Bakersfield, California website reported that Landon "became fatigued and dozed off" while driving. Ironically, friend and fellow chess master Elliott Liu just finished taking a class on sleep deprivation at Stanford University. His professor stressed the highly dangerous effects of inadequate sleep when driving, claiming that it is even more dangerous than driving drunk, as horrendous as that is. "To have Landon fall asleep at the wheel, mirroring exactly what we learned in class, hits me hard," said Liu. "[My professor's] persistent message just turned into reality for me. We will all miss Landon greatly." Catalina Foothills coach Robby Adamson has written a touching memorial to Landon at Chess Life Online. May his family, which has suffered too many tragedies, be comforted by his memory, and may we all learn to avoid such preventable accidents. SuperNationals IV has concluded, and comprehensive results are posted here. As of this writing, they haven't yet included the "biggest upset" in the results - hopefully that will be available shortly. The people who brought you Fritz and ChessBase have been busy. 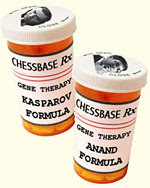 See what special training enhancements are now available at the ChessBase site. Courtesy of Chess Life Online, take a look at this video (taken by organizer Susan Conlon) of Jennifer Shahade giving a simultaneous exhibition. She certainly adds a twist to things. Untitled from jennifer shahade on Vimeo.